Bamboo is well-known for its beauty in the garden, making an exotic and interesting screening plant, a garden specimen or a potted plant that adds lots of height to limited spaces. What exactly is this plant, though? Where does it fit in our understanding of nature? What are bamboo plants? Remarkably, bamboo plants are just giant grasses. That’s right, relatives of your lawn. In fact if you look closely you might see that those bamboo leaves look eerily like the blades of grass growing from the stems that come up when you don’t mow the grass for a while. If you have ornamental grasses in your garden or growing nearby, you can see that they send up stems with leaves along them but in most grasses these stems die at the end of the growing season, to be replaced by new ones the following year. Now bamboo plants chiefly grow in areas with milder winters, so that opens up the possibility of not wasting growing resources on starting all over again each year, and instead makes it possible to keep those stems for several years – and bingo – you have the bamboo plant. Just like the grasses that grow in your lawn and garden, bamboo plants fall into two main groups. All grasses spread by sending out stems from the base of the plant, but some grasses send up these stems right beside the original plant, forming a dense clump, while others send them up some distance away, forming a spreading mass. Bamboo plants do the same. Many will stay neatly where we plant them, slowly expanding into a larger clump – we call them clump-forming. The compact Sunset Glow Bamboo and the beautiful Multiplex Bamboo are both clump-forming types. Others will spread by sending up shoots inches and even feet away from the centre, rapidly spreading. That habit can be useful when you want a planting to fill in with extra growth and form a dense screen, but it can also be a problem, especially in a smaller garden, when your bamboo plants start migrating into your flower beds and lawns. So choose wisely. There are over 1,400 different species of bamboo plants in the word, spread around the central parts of the planet, from Asia, through Africa and South America and into Mexico and the south-eastern United States. 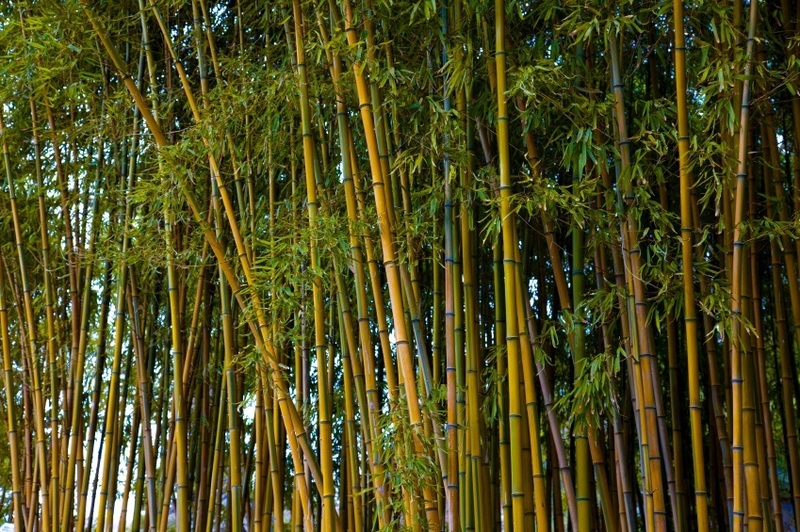 Apart from a few oddities that don’t have permanent stems, all bamboos produce long-lived stems varying in height from a few inches to almost a hundred feet tall, although most are between perhaps 10 and 30 feet tall. Stems vary in thickness from pencil-thin to 8 inches in diameter in the tallest species. Stems are usually green to brown, but the beautiful Black Bamboo has stems that exactly match its name. When growing in the wild bamboos often form forests, with leaf-less stems soring into the air, topped with clusters of leaves. Bamboos are also the fastest growing plants around, since some can expand their new shoots as much as 100 inches in 24 hours. Even ‘normal’ growth rates of 1-4 inches a day put these fascinating plants in the top-league for fast growing trees. At the beginning of each growing season buds just below the ground swell and expand, pushing up through the ground and emerging as new shoots. As is well-known, the shoots of some species of bamboo can be harvested at this early stage, boiled with rice bran to remove the toxic cyanide they contain and the central part makes the delicious bamboo shoot vegetable for stir-fries. An interesting thing about the growth of a bamboo plant is that the shoots emerge from the ground already their full diameter and grow without leaves until almost their full height. That final height obviously varies with the species of bamboo, but also with the age of the plants, water-supply, climate and general growing conditions. Once the stem is fully extended, then the leaves emerge along the sides at those ‘rib’ points on the stem, which botanists call ‘nodes’. One of the most extraordinary things about bamboo plants is their flowering cycle. Most plants flower each year when they are old enough, but bamboo plants flower just once and then die. Flowering produces a bounty of seeds, which then sprout and grow into new plants. The interval between sprouting and flowering varies from species to species, but is measured in decades, with the longest period being the 130 years it takes the Japanese Tree Bamboo to flower. No matter where in the word a plant has been taken, when the inbuilt ‘biological clock’ rings, every plant bursts into flower at the same time. Being a grass, bamboo plant flowers look like heads of grain or the seeds that form on ornamental grasses and there are tales of bamboo flowering saving whole communities from famine. So those bamboo plants which bring such beauty to our gardens and are of considerable economic value in the East are really just a crazy overgrown lawn grass! So next time you see one, that is something to reflect on.